Prime Minister Narendra Modi on Saturday assured the people of Assam and the Northeast that the Citizenship Bill will in no way cause harm to their interests. Addressing a public rally in Assam, Modi said the NDA Government is committed to protecting the language, culture, resources, hopes and aspirations of the people of Assam and the Northeast. “It is a national commitment to the people of the Northeast that they will not be harmed in any way and citizenship will be only granted after due investigation and recommendation of the State Governments,” Modi said. “It must be understood that there is a difference between those who forcefully entered the country and those who were “forced to flee their homes to save their lives due to their faith. Both are not the same”, he asserted. “We have committed to provide shelter to those who are minorities in neighbouring countries and had to leave everything due to the atrocities inflicted on them. They have come to our country and embraced the idea and ethos of Mother India,” said Modi at a rally in Changsari in Assam where he laid the foundation stone of the All India Institute of Medical Sciences (AIIMS). The Prime Minister also said the BJP is committed to implementing the 36-year-old Assam Accord and a committee set up on the implementation of its Clause 6 is a step in that direction. Modi also lashed out at the Opposition and said the main job of the mahamilawatwalas is to deride him and it seems they were all competing in an Olympics of hurling abuses at him. Calling the Opposition a mahamilawat (great adulteration) again, he said its leaders are only involved in “holding each other’s hands in meetings in Delhi and Kolkata for photographs”. “The job of the mahamilawatwalas is only to heap abuses and more abuses on Modi. It is as if an Olympics is on to deride Modi,” said the Prime Minister at a public rally in Agartala in Tripura. “The results of the coming Lok Sabha elections will show what it takes to lie to the people,” Modi said commenting on the allegations leveled by Congress on certain issues including the Rafale fighter jet deal. Hitting out at the Left Front without naming it, Modi said it was not interested in doing anything for the unorganised sector or the farmers when it was in power in the State. “Now for the first time in Tripura, under the BJP Government, paddy is being procured at the minimum support price. Besides, the recommendation of the Seventh Pay Commission was implemented. Tripura was deprived of development on the pretext of being a landlocked region, is now being made gateway of the South East Asia,” Modi said. Besides laying foundation for several projects during his two days north east tour, the Prime Minister interspersed his speeches with sentences in Assamese, paid rich tributes to the State’s icons Srimanata Sankardeva, Madhavdeva, Azan Fakir, Chaolung Sukapha, Lachit Barphukan, Gopinath Bordoloi and Bhupen Hazarika. He said previous Governments “failed” to honour these icons and it was the BJP Government which took the initiative of conferring the Bharat Ratna on Assam’s first Chief Minister Gopinath Bordoloi during Atal Bihari Vajpayee’s term and now to music legend Hazarika. Modi said the NDA Government wants to make Assam the oil and gas hub of the country and in the last four years projects worth Rs 14,000 crore have been completed. He also laid the foundation of the six-lane bridge over Brahmaputra river connecting Guwahati and North Guwahati. He also laid the foundation stone of NRL Bio Refinery at Numaligarh and a 729 km gas pipeline from Barauni- Guwahati passing through Bihar, West Bengal, Sikkim and Assam. The Prime Minister inaugurated and laid foundation stone of projects in Arunachal Pradesh worth over Rs 4,000 crore and said his Government was giving a lot of importance to improve connectivity in the sensitive border state. Terming the state the “pride” of the country, Modi said it is the gateway to the nation as it guards the frontier. It is the duty of the government to develop the state at any cost, he said. 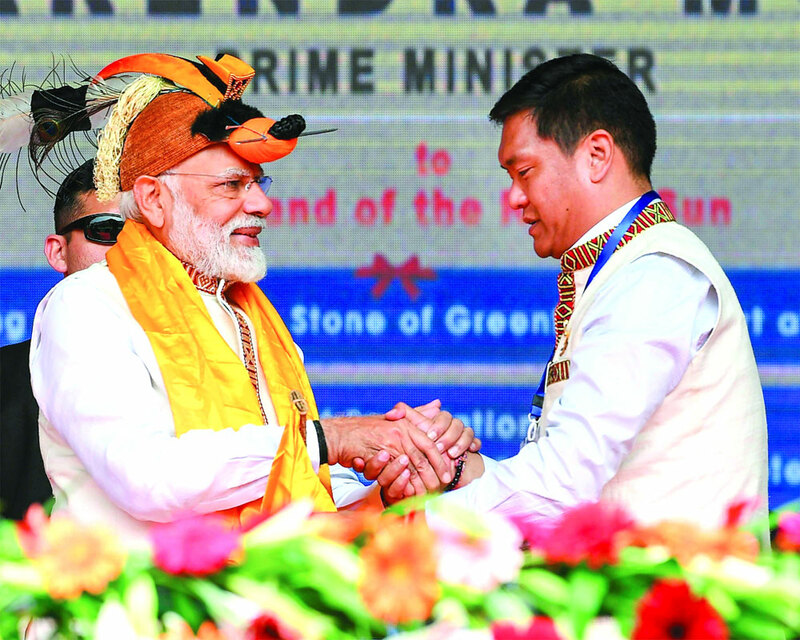 Modi laid the foundation stone for construction of greenfield Airport at Hollongi and inaugurated an upgraded and retrofitted airport at Tezu in Lohit district at a worth of Rs 125 crore through remote control at a function at IG Park. The Tezu airport will connect Guwahati, Jorhat and Hollongi. Fruit and flowers of the region can reach any market of the country in a few hours, the PM said. He also inaugurated a new Doordarshan 24-hours channel for Arunachal Pradesh.